On Wednesday, Dan and I were at lunch and he was telling me that he'd hiked Mt. Bierstadt the previous weekend. It was his first 14er and it sounded like he had some fun. We agreed that we needed to get out and hike something together. At the same time, Mark and I had to cancel our previous week's plans because I got a very bad virus on Friday before Labor Day weekend and spent the next five days in bed sick. So we also wanted to get out and do something fun this weekend. Meanwhile, I also knew that my buddy Joel was getting the 14er itch again. I hoped I wasn't dragging Dan into a situation that might be uncomfortable for him at this point since he had so little mountaineering experience. He'd never climbed anything class 3. I also didn't know how he'd deal with exposure, which this ridge has plenty of. I was worried how I'd do. Even though I was no longer sick, my sinuses had not fully recovered yet and I knew altitude would just make them worse. Even though Joel and I had hiked together a few times prior, I was also was worried how Joel would do, since he'd not climbed any 14ers yet this summer and a couple times in the past he's had issues with altitude sickness. I was also dreading the idea of driving up the Lake Como Rd. again and potentially not getting a summit since I had been up this road 6 times already. Once for Little Bear Peak and five times for Blanca Peak. The only one I wasn't worried about was Mark, since he's basically a hiking machine it seems. Friday night was a restless one. I had slept for maybe three hours total, but it was in short bursts mixed with waking from short dreams, sinus pain, and the frequent sounds of coyotes tearing some rodent to pieces. I was already getting boots on for the hike when my 3am alarm went off on my iPhone. I was overflowing with energy for some reason as we all piled in Joel's jeep. We endured the ride from the 2-wheel drive trail head near 8000' up to about 10,200' on Lake Como road. Joel did some great driving on this challenging road. I know from experience that it can be intimidating in the dark. We set off from our parking spot at 4:10am under a moon that was beginning to disappear behind the horizon. As we walked up the road, the stars in the now pitch black sky were simply amazing, with views of the Milky Way in abundance. Before long, we were passing Lake Como and a series of camps where others were just rising, making coffee, and getting ready for their own hikes. We passed the lake quickly, and were at Blue Lakes by sunrise which was disappointing compared to the sunrise I had seen in June when climbing Blanca. Just past Blue Lakes, you ascend the normal trail to the left of the waterfall. At the next pond, you leave the trail by going around the left of the pond on some talus. Aim for either a ramp or an obvious gully that will take you to the top of the southwest ridge. Mark took the ramp, the rest of us took the gully. 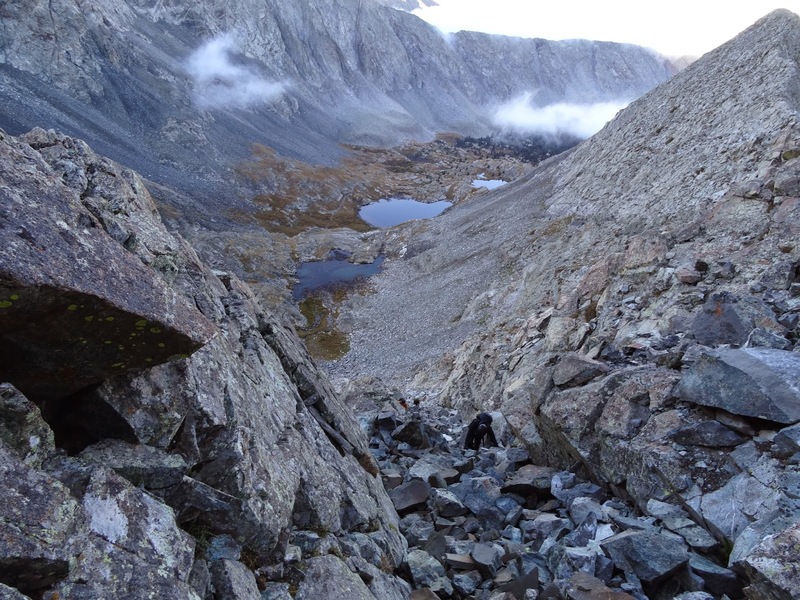 The gully is about what you'd expect, loose talus, some scree, some ledges. Mostly just class 2 junk. Before long we were back together on the ridge. I was in the lead most of the way up the ridge with Dan following closely behind. He was doing great despite the exposure which was nearly everywhere. My worries were calmed after he crossed this section in the picture below he cracked a joke to me on how I might have "sold this route" a bit when talking to him and Joel on Thursday at work. The hiking on this ridge was downright fun. There's solid rock for the most part, easy route finding, great views, and enough exposure to keep your attention. Dan in front on a very exposed section, followed by Joel, and Mark. Joel enjoying a beautiful view on our wind-free day. Dan scrambling back up to the ridge from a section where we needed to drop down a bit. Mark perched on an airy ledge, eyeing the Little Bear to Blanca traverse, which I can see him and I doing next year. 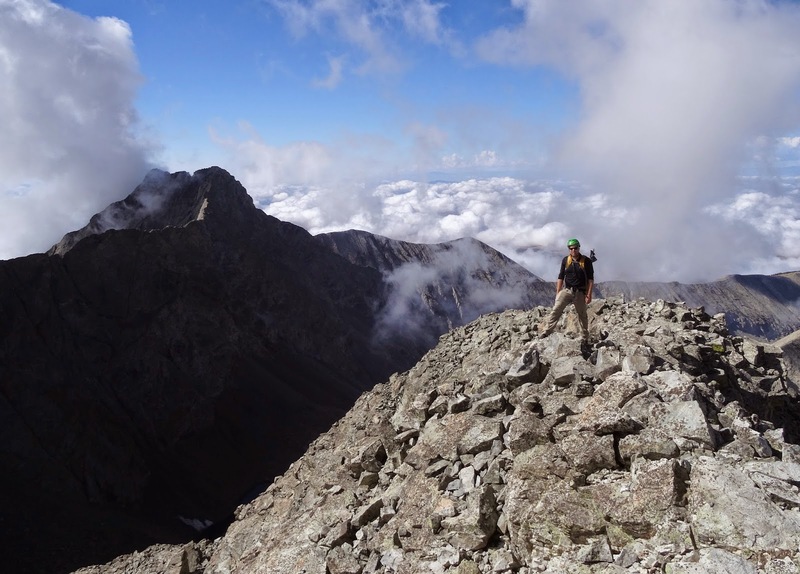 If you are ever doing this ridge in the summer, be on the ridge early to avoid afternoon thunderstorms, since from where you gain the ridge, to the summit, took us about 2 hours. We could've probably shaved a bit of time off that, but we were taking our time, and enjoying the stellar weather. After a couple of hours of fun scrambling on the ridge, we hit the last 100 feet before the summit. This is where we encountered just the thinnest layer of ice on some rocks. We navigated this area carefully and arrived at the summit just after 10:00am. Smiles were all around as a sense of accomplishment was shared among the group. Mark and my first shared 14er summit and we're being photo-bombed by Little Bear Peak. 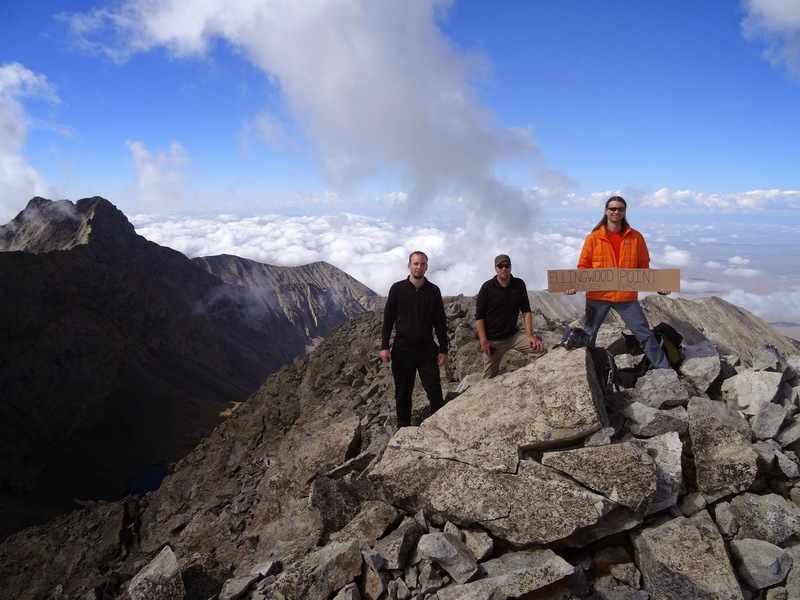 Dan, Joel, and Mark celebrating a well earned summit above the clouds. 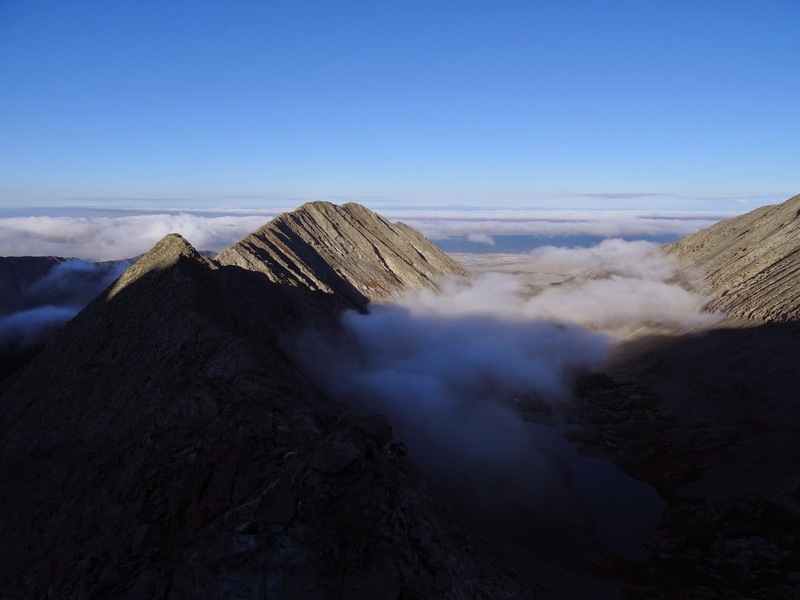 From the summit, Mark took off towards Blanca Peak and the rest of us stayed and just chilled for 20 minutes before beginning our descent. I predicted that Mark would meet us again by the time we were at Crater Lake, since we descended the standard route, and my prediction was only off by a few minutes. I won't bore you with stories of our descent other than to say, it was long, and hot, and I was grateful for how high Joel drove in his Jeep. On the drive out, we stopped at a place in Blanca, CO called The Main Street Café. They have great food and it's reasonably priced too. This place will be a permanent stop anytime I am down in the Sangre De Cristo range.